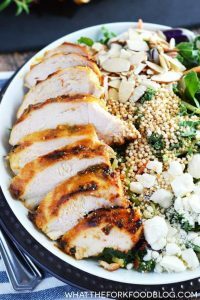 These Fast & Healthy Gluten Free Dinners will take the stress out of dinnertime and inspire you to get in the kitchen. There are a lot of things I stress about as a Mom. Should I be having them help out more around the house? Is Skye ready to learn to read? Should I keep letting her sleep with us or force the own bed issue? With all these things to fret over, dinner shouldn’t add to the stress. Sadly, all too often, it does. As a food blogger, I often feel like I should have it a little more together, but the what is for dinner question can be stressful even for me. I know many of you feel my pain, especially when you are dealing with food allergies and intolerances. Sometimes you just want dinner to be super easy to make, but at the same time, you need it to be healthy for everyone eating. 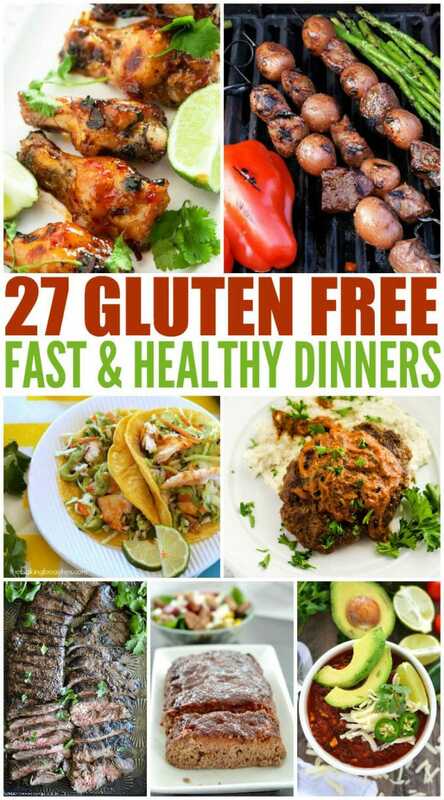 So with saving time and eating healthy in mind, I have pulled 27 Fast & Healthy Gluten Free Dinners that will help you eliminate stress over what you are serving for dinner. I hope these recipes inspire you to enjoy your time in the kitchen as much as they do me. Who says that you have to have a special occasion to have a good steak? 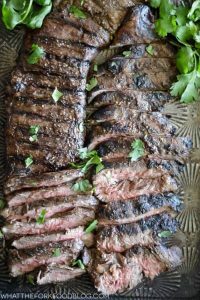 This skirt steak if perfectly easy for any dinner and doesn’t need an occasion to be made or enjoyed. Most of us are used to eating this recipe out of the freezer aisle at the store. However, it’s so easy to make at home and definitely tastes much better than the frozen kind. 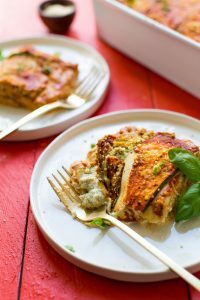 If you’re looking for a healthy dish that doesn’t divert too far off the path from what you’re used to, this lasagna is it! You won’t even know the difference but your body will! 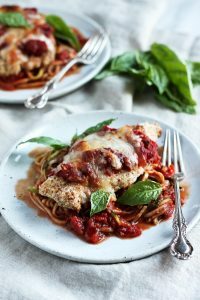 Chicken parmesan has always been one of my favorite recipes. However, mine has always been the oily version and this baked version blows it out of the water. Fish tacos have quickly become a favorite dish around our house. 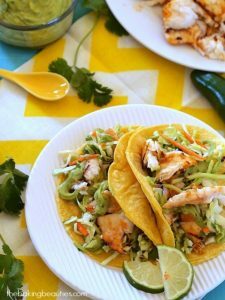 These grilled fish tacos are super quick and easy to make so it works for any day of the week. If you’ve never had cajun pasta, you’re missing out. There’s just something about the heaviness of pasta and the deliciously strong flavor of cajun that mix so well, you’ll want more than seconds, you’ll want fifths. 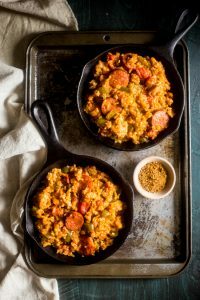 Jambalaya is one of the best dishes you’ll ever have. It’s a classic dish for a reason. It’s bursting with flavor and is, without a doubt, one of the top comfort foods. When made correctly, a taco is everyone’s favorite meal. 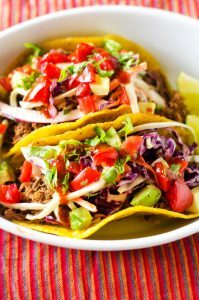 They can be made in so many different ways and shredded beef is at the top of my list. Try them ASAP! 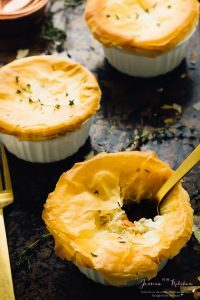 Pot pies are an ultimate comfort food and always seem to hit the spot. When you first break into that crispy, flaky crust, it just melts a foodie’s heart. 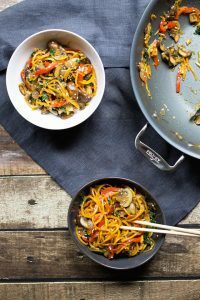 Lo mein is always in our cabinet because it’s such a quick and easy go-to meal option. It’s not overly unhealthy and does a great job of being filling. When you add butternut squash like this recipe, it becomes the perfect recipe. You can’t beat a good enchilada dinner. 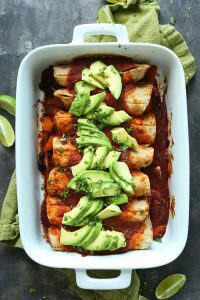 Black beans are have so much flavor and they make the perfect enchilada main ingredient. Chicken salads are my favorite salad. 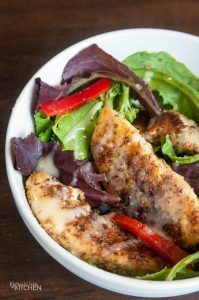 I hate having to buy mine but this chicken salad recipe is one of the best homemade salads I’ve ever had. Try it and you’ll see! 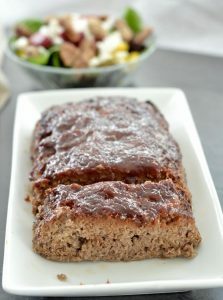 If you’ve never had paleo meatloaf, there’s no reason to shy away from it. 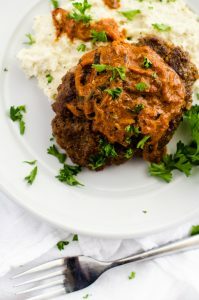 It’s just as delicious as your regular, run of the mill meatloaf and you’ll wonder why you even questioned it in the first place. My husband is all about the steak and potatoes kind of meals. 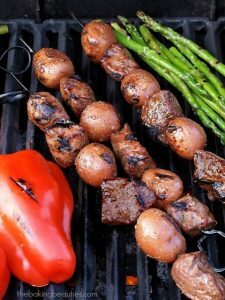 What better way to quickly accomplish that kind of meal than a steak and potato kabob? Perfect. Mustard always makes the perfect ingredient when it comes to baking chicken. Especially when you add a twinge of sweetness like maple syrup. You’re going to love this one! 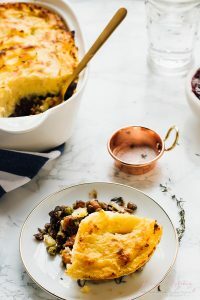 If you want a recipe that will fill you right up and make you so comfy you’ll want to sleep, try this shepherds pie out! It contains everything you could ever want in a meal, summed up in pie form. 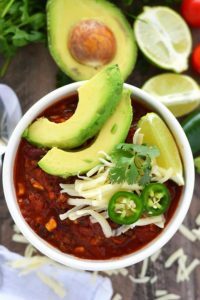 I don’t know anyone who doesn’t adore some sort of chili. 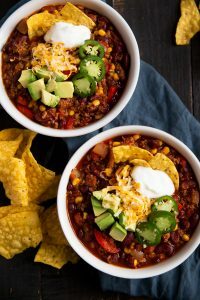 I used to question turkey chili because it couldn’t possibly be as delicious as the beef chili I was used to. I was wrong, it’s full of flavor and unforgettable. You don’t have to go pay high prices for a good chicken wing. 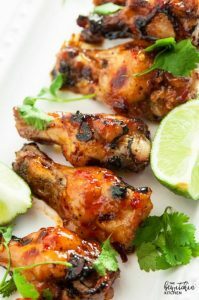 With this delicious recipe, you can make the best chicken wings and save your arm and leg from high pricing. Chicken nuggets aren’t easy to find in gluten free form. 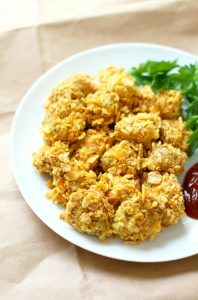 This recipe is one delicious chicken nugget and isn’t overly complicated either! 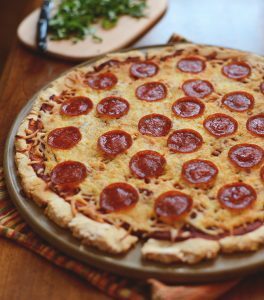 When I first started eating gluten free, pizza was a difficult task to tackle. This recipe makes it easy while producing a delicious pizza. 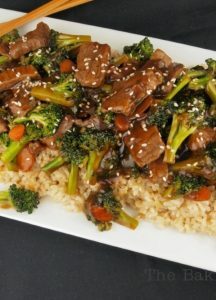 Broccoli and beef is the perfect go-to dinner. 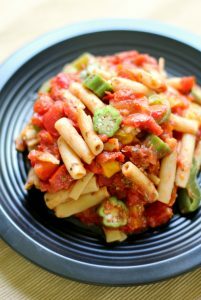 It’s easily made gluten free without any hassle at all which makes it a favorite for me! I don’t know why I had never thought of making my chili taco flavored until now. Let me tell you, it’s a delicious idea and the entire family will love it. Previous Post: « Sit and Stand Desk Converter – An Easy Way to Stay Healthy?